I recently visited Page, AZ and Lake Powell. Page and Lake Powell offer an incredible variety of world-class photography opportunities. I will be posting a few articles and videos about my experiences there. My hope is that this content will be helpful to photographers interested in or planning a trip to this amazing region. This post specifically covers my experience at Wahweap Overlook. This is an extremely easy-to-access location. No hiking is required. Wahweap Overlook offers excellent panoramic views in every direction, allowing photographers to capture multiple unique vistas from a single location. However, the most exciting perspectives are certainly to the east where Lake Powell and Glen Canyon stretch endlessly to the horizon. I arrived two hours before sunset to try and capture some of the grandeur. View of Navajo Mountain and Lake Powell from Wahweap Overlook. Most of the great details that are visible from Wahweap Overlook are simply too small to capture with wide focal lengths. For most of the shoot I used my 70-200mm lens from anywhere between 70-150mm. I merged portrait shots to create the super-resolution panoramas shown in this post rather than taking images at a wide focal length. Shooting wide and cropping into these aspect ratios would result in an unacceptable loss of resolution. Besides, the telephoto focal lengths compress depth in a way that allow far-off rock formations to become subjects — rather than merely accessories — in these images. View of Wahweap Marina and Lake Powell from Wahweap Overlook. For these reasons, I highly recommend having a telephoto lens available when shooting from Wahweap Overlook. However, about 1.5 hours into the shoot, the wind picked up considerably. It became nearly impossible to keep the camera stable enough for the relatively short shutter speeds I was trying to use (on the order of 1/40 second) — even on a tripod. I may have been able to bump up ISO and shoot faster. Instead I switched to a wider lens which wasn't as susceptible to the wind-induced blur. However, I wasn't able to find wide compositions that I liked as much as the tight images I had already shot. Having some epic cloud formations or weather might have made this a more viable solution. 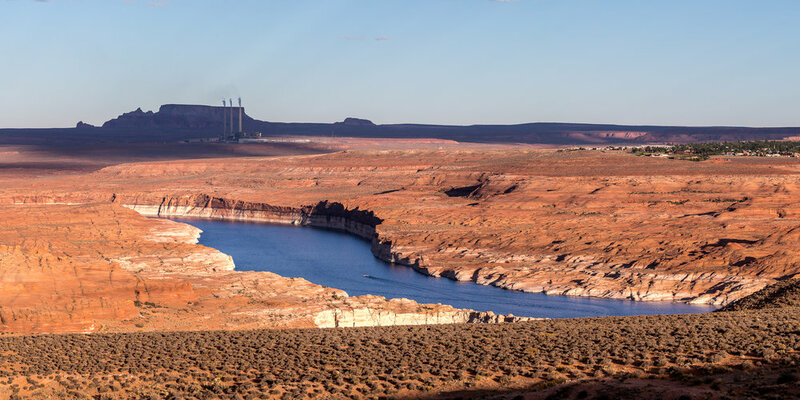 View of Page, Lake Powell, and Navajo Generating Station from Wahweap Overlook. Despite the wind, this was a great place to shoot. There is a huge variety of images waiting to be taken (particularly if you bring a telephoto lens). I recommend coming early. If there are clouds or weather, you will be able to "follow the light" as different portions of the landscape alternate between light and shadow. Let these ever-changing light conditions guide your compositions. Another reason to come early is to claim your spot before someone else gets it. There were several dozen people up there with me (mostly smartphone-wielding tourists but also a few other tripod-mounted photographers). There's plenty of room so no one will be breathing down your back. But to get your first choice you may want to try and beat the crowds if you are coming in the popular tourist months (i.e. May-September). All content © Daniel Whitten 2018.